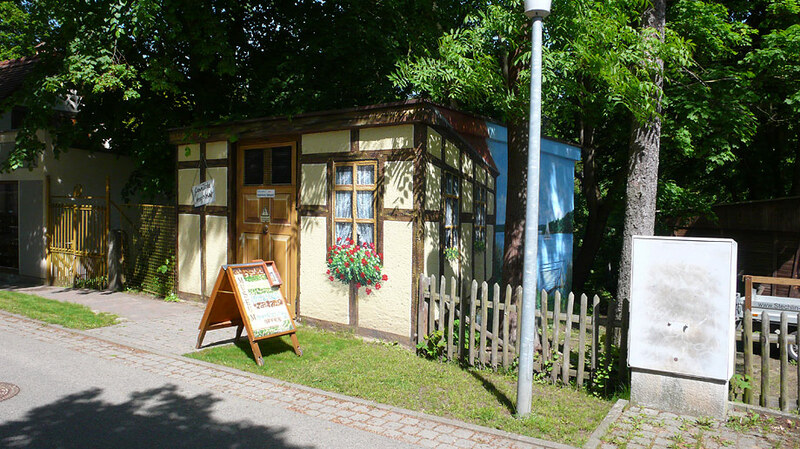 Disguising utilitarian micro-architecture seems to be well on the way to becoming a genuine folk-art tradition in these parts. 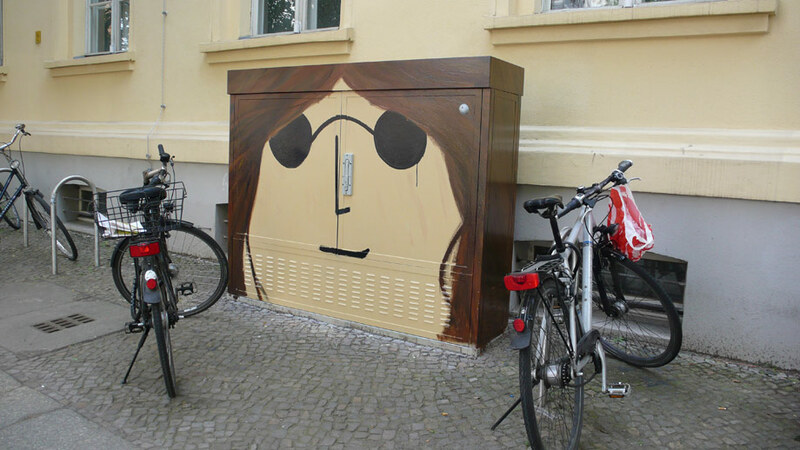 Last July I reported on a DSL box in Potsdam which had been carefully painted to resemble the wall behind it, including a row of terra-cotta tiles running across the top. Since then I’ve seen more and more examples, not only in Berlin, but further afield too. The diguises fall into two categories: cloaks and costumes, and with ‘cloak’ I mean the science fiction variety; an invisibility shield. 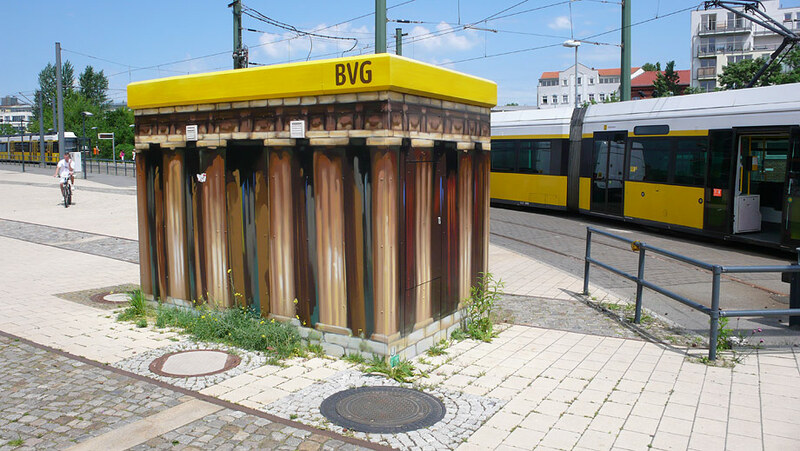 The BVG, Berlin’s public transport network operator, have been busy building toilets for its bus and tram drivers across the city. Whilst taking the picture above, I got chatting to a tram driver seeking relief at a terminal stop at Nordbahnhof. He told me that all the BVG loos have been decorated differently. Which means we won’t need to put up with badly painted Roman temples, but a wide variety of shakey costume architectural parodies. Whilst I dig the idea, the execution leaves a lot to be desired. However, I must admit to being fascinated by the positioning of the two tell-tale, off-the-shelf vent coverings, which look as though they were added after the paint job. 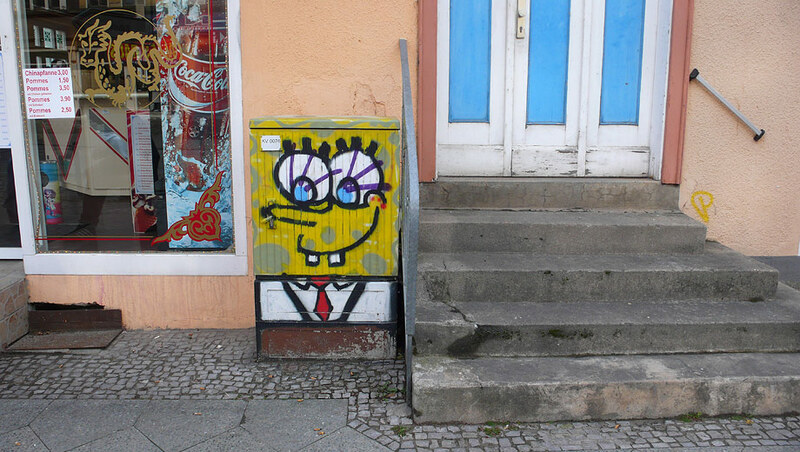 Out in Fürstenberg, a small town 75km north of Berlin, some wag has produced a stunning portrait of SpongeBob Squarepants using a ubiquitous curb-side Grey Box as a conveniently shaped canvas. Another costume, produced, one assumes, by an anonymous pupil of the John Lenon Secondary School in Berlin’s Mitte district. For me, this marks an artistic zenith in the quiet conflict which has been waging for months between sprayers and Deutsche Telekom buffers. I’m hoping this piece of urban decoration will be lasting, but some other can-weilding cretin has already blemished the piece since the photo was taken. I’m going to leave this meander with another example from the countryside: this time from Neuglobsow, a lakeside hamlet close to SpongeBob’s home town, and a great example of a ‘cloaked’ hut. It turned out to be an electrical substation, and obviously one of such aesthetic embarrasment to this history-conscious community that it was worth disguising as a timber frame cottage. Apart from the exaggerated perspective, and the peculiarly uninterrupted view of a distant lake, the effect is pretty convincing even from a distance of just two meters. So absorbing is this example, that the undisguied Grey Box to the right goes by unnoticed. Paradoxes abound. For me this is all about a healthy erosion of the boundry between individuals and the civic infrastructure. Regardless of whether the decorattion of these non-descript structures is legal or illegal, it’s a way of reclaiming the streets and turning them into an extension of private domestic space. Customisation and reappropriation of that which is nominally out of bounds is a reaffirmation that the place you call home extends beyond the four walls of your dwelling.